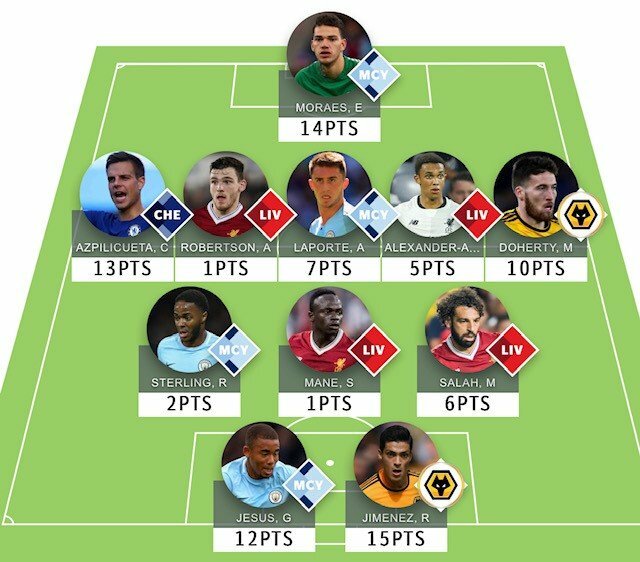 Here’s our GW34 fantasy football tips article where Andrew Ferguson reviews his GW33 teams in FPL, TFF, Sky and Sun and outlines his plans for GW34 including a draft wildcard team. Andrew finished top 1k in TFF, Sky and FPL plus 15k in Sun in 17/18. 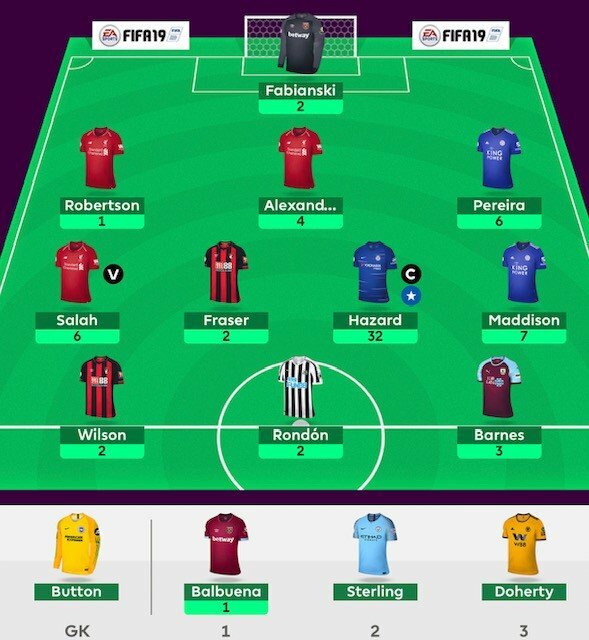 An decent week in the end with Hazard (cap) paying off handsomely. Salah, Maddison and Pereira returned with flops everywhere else. Not much more to say from the gameweek aside from thankfully it’s wildcard time! I have a decision to make around captaincy – whether to have two bites of the cherry with Duffy or Ryan, or whether to attack a little with Kane. I will very likely go with Kane against a poor Huddersfield but we will see what the week brings. Another good week and big rank boost as I take advantage of the extra fixtures. I swapped out Van Aanholt to Laporte on Saturday afternoon which earned me two clean sheets between them before Jesus returned again to ensure I will have a good coverage in the FA Cup final. Sunday was also a good day with returns from Doherty and Jiminez whilst Wolves’ FA Cup exit hopefully means they will play all the remaining league games. Azpilicueta’s clean sheet against West Ham somewhat negated Hazard’s brace. This leaves one transfer for an injury with a flexible formation to be able to bring anyone in. The Champion’s League results may help with decision. A quiet weekend due to the blank fixtures although Maddison’s captain returns were welcome on Saturday. Lacazette blanked on the Sunday although I held rank before Hazard smashed it last night to reshuffle the top 20 a little. With only one transfer left I can’t afford to be creative so am just leaving it for an injury or obvious move. 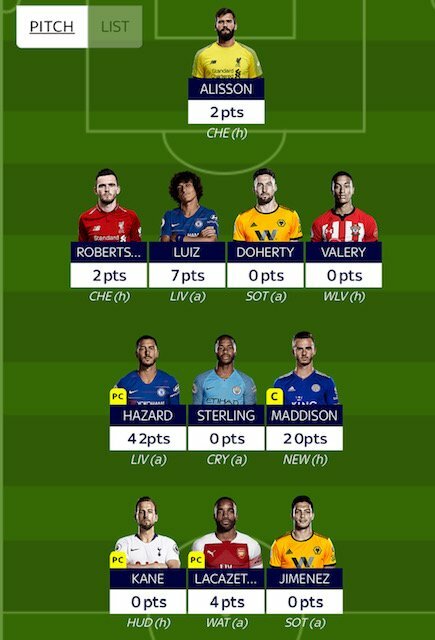 I don’t have a Brighton or Cardiff player for next week but they aren’t too exciting so I will very probably leave it. My captains will be Maddison, Kane, Sterling (if he starts, if not Hazard) and Lacazette. A decent weekend and rank rise thanks to Liverpool, City and Chelsea winning; Jota also returned on his return to my team. I have good coverage all week now with the Champions League and Europa League matches so I am hoping for another big boost before the weekend. Kane’s great run starts on Saturday against Huddersfield and I feel I need him in but am struggling to decide how to raise the funds. Jesus to Kane leaves me 2m short so my current thinking is Azpilicueta to a £2.6m defender with not too many great options around! Coady is £1.1m which also leaves me budget for May, this may be the way to go. Same as above in regard to returns over the weekend and week to come. Similar to above although as this team doesn’t have Mane I have more budget to play with. Jesus to Kane and taking Pedro out will leave me £4.5m to find a defender or midfielder giving me pretty much the pick of the game. I am currently tempted by Bernardo at £4m. 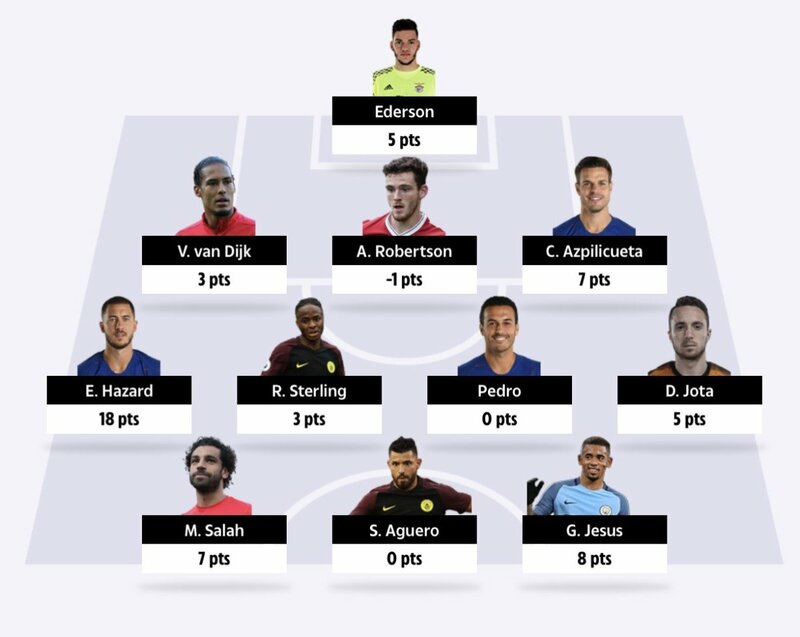 Good luck everyone for GW34! Are you confident about no City coverage in your FPL team draft? It’s also very reliant on Wolves & Spurs. I expect Salah is in place for the TC in GW36 but, in my opinion, Salah > Mane and Son > Sterling is a good switch. 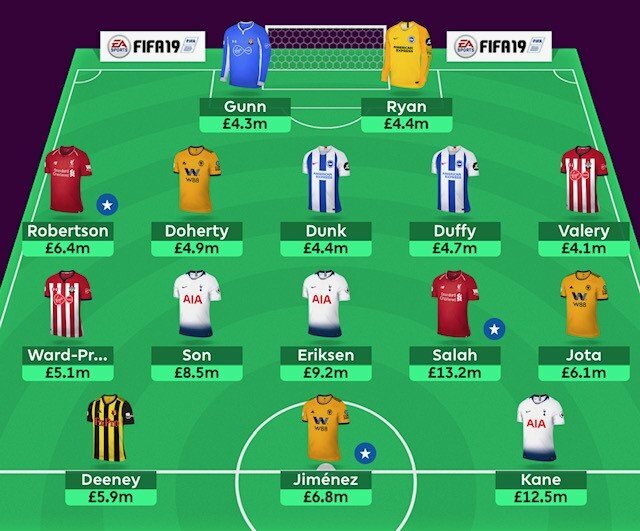 FPL – You must have plenty left in the bank. Laporte for Doherty? Considered Bertrand instead of Coady? FPL… i was going down the same road with no City coverage. Saw the folly in this so have now brought in Sterling. I think Mane is adequate Pool attack coverage. He could easily outscore Salah over remaining fixtures… or Salah could blow him away. Either way it’s a gamble, but Mane much cheaper. 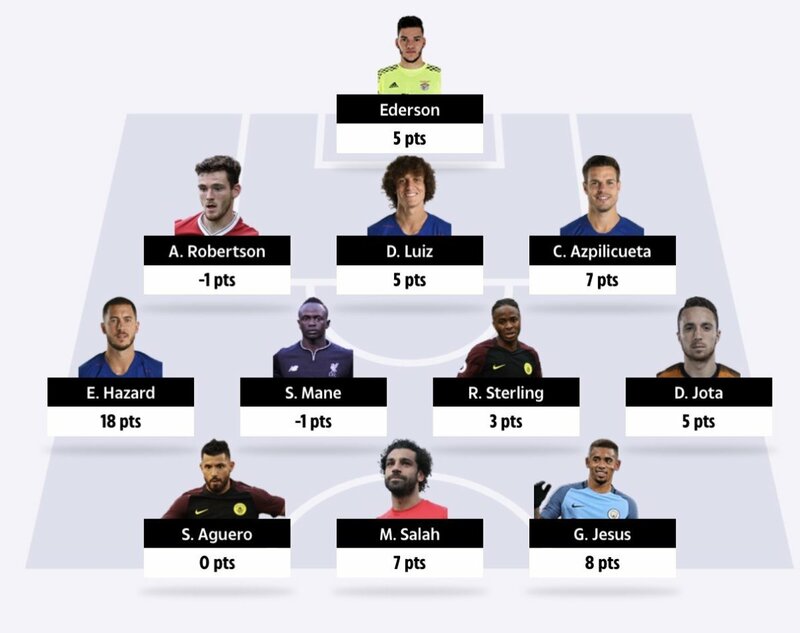 Hi Andrew, great performance in fantasy football across all the different platforms. I play sun dream team and TFF myself. Currently ranked 62 in the TFF after reading your tip on Redmond. Thanks for that. Hope you enjoy a great finish to the end of the season.